"Composed toward the end of the first millennium of our era, Beowulf is the elegiac narrative of the adventures of Beowulf, a Scandinavian hero who saves the Danes from the seemingly invincible monster Grendel and, later, from Grendel's mother. He then returns to his own country and dies in old age in a vivid fight against a dragon"--Jacket. At the beginning of the new millennium, one of the surprise successes of the publishing season is a 1,000-year-old masterpiece. 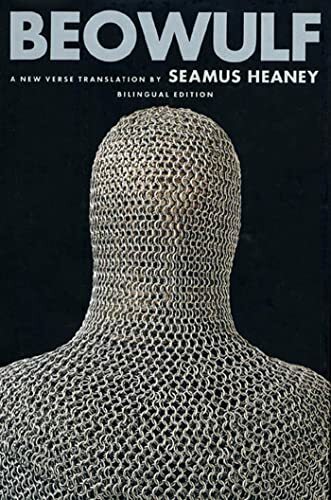 The book is ''Beowulf,'' Seamus Heaney's modern English translation of the Anglo-Saxon epic, which was created sometime between the 7th and the 10th centuries. Translation is not mainly the work of preserving the hearth -- a necessary task performed by scholarship -- but of letting a fire burn in it. So it is with no immoderate disbelief that I heartily commend an anonymous poet to the modern reader. This poet's work is extremely powerful, and Seamus Haney has translated it to excellent effect. Simply put, Haney has breathed life into this remarkable work for me. It is a delight to read (I've read it twice now). Haney's publisher has prepared his text, and on the opposing page, has reproduced the original text itself. The Old English is exhilarating--I enjoy nothing more than conquering a few words in this tongue. I cannot vouch for Haney's accuracy --I am no expert in Old English, but his language has the touch than only a poet could lend to this work. He has also composed an introduction to the text, which I was glad to read, and has produced genealogies that are quite useful for the reader, in order to unravel the snarled lineages of the Scandinavian clans. The language is very direct, of course: it issues a kind of confrontational fortitude that, in the words of one friend "doesn't use all those Latin-derived words." The overall effect of the poem reminds me of the coronary injection in Quentin Tarantino's film Pulp Fiction. From the beginning of the poem, the reader is overwhelmed by the sense that each of Beowulf's choices will net immediate, life-changing results. We don't know until the end of the work whether his decisions are good ones, or if they will prove fatal. Still not convinced? You think you'd rather read a contemporary action-packed novel than a 1300-year-old poem? Think again--this poem is populated by a fraternity-house of noisy, mead-filled warriors whose primary goal, it seems, is to exact vengeance on enemies, shatter a few skulls, and destroy evil beasts, (in one case, ripping off a limb or two, just for show). The actual monsters (and the dragon) in Beowulf are truly evil and despotic. When they are not destroying mead-halls or consuming warrior-flesh, they lurk deep in a boggish nightmare-underworld of caverns and tombs of long-forgotten kings. Rest assured that excerpts from Beowulf will never grace a Hallmark card--the poet used ink made from testosterone. In fact, female characters tend to waft into poem, and drift out again, having little, if any effect on the overall direction of the poem. Female readers may find this repulsive; however, the poet considered Beowulf's world a boy's world, and depicts it thus. Suppose a monster is destroying your village. To kill such a monster is good, right? The poet is not so sure: his answer is a definite 'Maybe'. Suppose you kill said monster. Fine--now the creature's whole clan descends upon your city, angrier than ever, seeking bloody vengeance on your family. Despite this, the poet asserts that to remain idle may be more dangerous still. A strong king is revered by his clan, right? What if that king dies in a battle? What would become of the king's clan? The Geats, Beowulf's clan, die in just such a way. Whether you do, or whether you don't, you are still damned. So go right ahead. The author wrote Beowulf in the Christian era, but pre-Christian sentimentalities still rule the poet's world. How can a "turn-your-cheek" Christian fit in a world where "an eye-for-an-eye" rules the land? Maybe the two tenets are incompatible, or maybe not. The author grapples with precisely this issue. Although the text is not implicit, the thought draws the reader like an overwhelming tide to Beowulf's end. This poem could gain a particularly strong appeal in times of war. Beowulf is a warrior's Ecclesiastes. The reader comes away with the sentiment that Beowulf did everything he could, yet, all around him was, ultimately, vanity. With his death (I hope I didn't spoil the ending for anybody), Beowulf's land will certainly be invaded and his tribe's cultural identity will evaporate. However, the Geats build him a massive funeral pyre that can be seen from miles away, at sea. As Beowulf's ashes ascend to heaven humankind can be hopeful. Whether Beowulf dies or not, the war-cogs rattle forward. Battles will always be won and lost, although, sometimes, those battles will be great. Strong people will live awhile, and eventually die. Weak people will fade. But, still, the sun will rise in the morning, and as ships sail by Geatland, the crew will see it: the mighty pillar for a mighty warrior. This is for many to see, and for all to remember. Þæt wæs gôd scop. Few adults approach Beowulf without some knowledge of the story. It is generally read in high school and again in college. Grendel and his mother are the nefarious duo tormenting the Danes in the reign of King Hrothgar. Beowulf comes to the rescue and is, of course, successful. Beowulf returns home to Geatland, where he eventually becomes king. But the story doesn’t end there and there is not a happily ever after. Beowulf is killed by a dragon in his old age. His body is burned and the Geats begin to live in fear that their enemies will now attack. I read it in high school. I read it in college. It was considered a boy-book, to be avoided if possible. Not to be considered for pleasure reading—ever. I did peruse the Tolkien edition in the seventies – but it was Tolkien and the seventies. I did not read the entire text. So what brings a middle-aged woman back to Beowulf? And reading it wasn’t about the story—it was about this particular interpretation of the story. Grendel still dies by Beowulf’s hand. The dragon still kills Beowulf. And it’s still a boy-book, a profoundly eloquent boy-book. Opening the book to any page offers up the power of Heaney’s linguistic faculty. “I adopt you in my heart as a dear son. Nourish and maintain this new connection, you noblest of men; there’ll be nothing you want for, no worldly goods that won’t be yours” (63). The simple addition of a semicolon to a text adds another layer of depth to Heaney’s interpretation of the original language. Skimming through the introduction of the Bolton & Wrenn critical text, it turns out that we know surprisingly little about what must be one of the most-studied poems in the canon. It has survived in only one manuscript, the famous "British Museum Cotton Vitellius A XV" (bizarrely, the emperor Vitellius comes into it because it's his bust that stands on top of that particular bookcase). In fact, there are very few Old English texts that survive as multiple copies, so this uniqueness isn't unusual in itself. The manuscript seems to have been written around the year 1000, and textual evidence suggests that it's at least the third generation of copies since the poem was first written down. When and where that was is hotly disputed, but Mercia in the second half of the 8th century is a strong possibility. The action of the poem is set in a pre-Christian past in Denmark and Southern Sweden (with some mention of actual historical figures from the time), whilst the poet is obviously from a Christian background and refers quite freely to the Old Testament. What I found most surprising was to discover that the poem was not conspicuously a "classic" in its own time: we don't have any other contemporary references to it (apart from the "Finnesburg fragment", a single page of MS that seems to come from a different version of part of the same story), and as far as anyone can tell it fell completely off the radar of English literature between the end of the Old English period and the time around 650 years later when the first modern scholars became interested in Old English manuscripts and discovered this poem, bound in with a prose translation of St Augustine. So Beowulf is only part of the history of English literature with hindsight. Seamus Heaney, of course, saw it as rather more than a philological crossword puzzle or a Boys' Own adventure story, otherwise he wouldn't have bothered with it. He points us in particular at the last part of the poem, where the elderly (70+) hero decides that he owes it to his people to take on one last dragon, even though it will certainly cost him his life. And indeed, the anonymous poet deals with the complex emotions involved here a little less brusquely than he does elsewhere - but this isn't Shakespearean drama, and we shouldn't expect it to be. This was a surprisingly speedy, easy and enjoyable read--for which Heaney, the translator, deserves a lot of credit. Especially given this is a verse translation. I've found that I have preferred prose translations of Homer and Dante because those trying to be true to alliteration, meter and rhyme often feel forced, awkward and occlude the meaning. It probably helped that Heaney is a distinguished poet in his own right; his translation was fluid, with a rhythm and tone somewhere between Homer and Tolkien in feel. And the story is fun, a Pagan tale set mostly in Dark Ages Denmark with Christian interjections by the original poet who probably was a monk writing anywhere between the mid-seventh to the end of the tenth century. There are monsters, notably Grendel and a dragon with his horde. What's not to love? Heaney's done a marvellous job on his own terms: creating a contemporary poem out of the ancient one while remaining as true as possible to the original. and i always love versions that place the original right beside the translation. but it's interesting that Heaney's version isn't so very far from Michael Alexander's much earlier scholarly translation. and Alexander manages to keep much more of the original wordplay, without losing the form. he's also got a densely illuminating intro. the Alexander sounds a lot more like we expect Beowulf to sound, though, because he isn't trying to update it, and creating brilliant poetry for this era is far from his intention. still, they are both kind of amazing, and i'm glad to have them. the Burton Raffel translation, on the other hand, i threw across the room, then de-accessioned. an example from each: the line on the death of Grendel's mother. in Heaney: she fell to the floor. The sword dripped blood; the swordsman was elated. in Alexander: she fell to the ground: the sword was gory; he was glad at the deed. in Raffel: her body fell to the floor, lifeless, the sword was wet with her blood, and Beowulf rejoiced at the sight. the Raffel is terribly prosaic, not even following the poetic line, the Heaney goes for something specific in the poetry, but the Alexander, although sounding a bit archaic next to Heaney, conveys it all. I love Heaney's translation, but for me, the real gemlike quality of this text is the matching Old English printed on the opposite pages -- it's just too much fun (at least if you're a lit geek like me)! Beowulf translated by Stephen Mitchell was sent to me by Yale University Press via NetGalley. Thank you. This Beowulf by Stephen Mitchell is an very entertaining translation, The adjective that comes to my mind is "robust." The narrative is straightforward and the flashbacks and foreshadowing are not awkward and do not stop the forward movement of the story. I taught Beowulf for many years to high school students and I wish I had this version. The literature anthology I used had the Kennedy translation which I personally love for it lyric imagery. In Kennedy, the lines about Grendel approaching Heorot (lines 678-680) are "From the stretching moors, from the misty hollows, Grendel came creeping, accursed of God." The Mitchell translation renders the same lines as " Then up from the moor, in a veil of mist, Grendel came slouching. He bore God's wrath." I like the former, but I know my students would have preferred the latter. In the end, whether it be Mitchell, Seamus Heaney, Charles Kennedy or E. Donaldson, all translations of Beowulf are a good thing. I am sure the scops who entertained their listeners during the black nights in the cold north would each have put his own spin on the story. Make it beautiful or make it bloody. One thing is for sure. Beowulf can never be boring. The mighty young hero of the Geats rescues the Danes from two hellish monsters that are slaughtering their warriors as they sleep in the royal banquet hall. Then heaped in glory and treasure he returns home to become, in his old age, king and dragon-slayer: the final glorious deed that ends his life. Raffel's translation into vivid alliterative modern English is vivid and exciting. Another re-read prompted by the desert island books conversation. this is just fabulous. I know the original derives from a oral tradition, and I feel that this is designed to be read aloud, not to oneself. the meter is unlike the iambic rhythm we're so used to now, but the alliteration works and the lines sort of trip of the tongue. It's never a dull "te tum te tum te tum" thing - the words almost have a life of their own. stretched his memory for stories of childhood. remnants of his youth from reaches of his mind. turns that treachery to trust and reward. Warrior Beowulf saves the Danes from the monster Grendel and then Grendel's mother and then many years later does battle against a dragon guarding a hoard of gold. I loved reading this. The poetry of the Heaney translation is very vivid and flowing, and creates a great atmosphere of fighting and carousing and boasting warriors and epic battle against mythical beasts. The story is dark and sometimes gruesome, and it is not at all hard to imagine the poem being recited around the fire by Anglo-Saxon warriors, passing round the cup of mead as the tale unfolds. Who knew I would ever enjoy Beowulf. I remember struggling through it in school and not making any sense of it (although the fact that an elementary teacher first assigned it may have added to my confusion). Heaney's translation was a revelation. I had heard such strong praise, but was still reluctant to revisit the epic. My sister finally persuaded me to read it to help her prep to teach a new Brit Lit class. I was blown away. Not only could I understand what was going on, I was engrossed it the plot. I actually could not put it down. I have read many translations and this is my favorite. I love the poem/story of Beowulf and read it often. This is not only an excellent translation, but it is such an easy to read version that I must give it 5 stars. Read this version and enjoy a true classic tale that will keep you interested from start to finish. This translated version has the Olde English verse written on the left page, and the modern English verse on the right page. As Heaney states in the introduction, he has tried with this translation to keep the language simple and as the original intended the meaning to be. He favoured meaning over rhyme, and as a consequence there is little rhyme. But the rhythm is certainly there and it reads very well.